The federal government said Wednesday it will crack down on unscrupulous immigration consultants. Immigration Minister Denis Coderre says the business will soon be controlled by a new regulatory body. Coderre referred to some immigration consultants as "vultures" for charging exorbitant fees and then failing to provide promised services. "We have to make sure that the people when coming here, it is to fulfil their dreams, not empty their pockets to those vultures who enjoy themselves too much," he told a news conference. A federal report last year called for action against the unsupervised legion of non-lawyer immigration consultants. It said the worst in their ranks were tarnishing Canada's name. An expert panel told the government that some consultants are involved in smuggling people, while others produce fraudulent documents to get foreigners into Canada. Coderre says the regulations will be tabled by the end of April or beginning of May 2004. "The plan is to regulate in a very specific manner the way that immigration consultants operate," he said. He has reallocated $700,000 in his department budget for an action plan, a framework and a presentation he hopes to discuss with the provinces at a federal-provincial meeting in Victoria on Oct. 15. The plan will ensure "a regulatory body with teeth," Coderre said, to deal with offshore consultants as well as those in Canada. "Those vultures are not just domestically, they're also offshore," he said. Last March The National Alliance of Philippine Women in Canada (NAPWC) denounced the ads placed by Diva International and published in the Montreal Gazette, which valued three Filipino domestics at $800 each, soliciting bids for their services. The organization also called on the Canadian Citizenship and Immigration Minister Denis Coderre to immediately close down the agency that placed the ads. "We deplore these ads that degrade and peddle Filipino women as mere commodities for sale to Canadians for a minimum bid of $800," says Cecilia Diocson, chairperson of NAPWC. "These ads attack our basic human rights to dignity and equality. They promote hatred and racism." The organization wrote letters protesting the ads to the Montreal Gazette and CanWest Global. The group also wrote a protest letter to Minister Coderre, who oversees Canada’s foreign domestic worker immigration program known as the Live-in Caregiver Program (LCP). As an overture to this year's worldwide Ukrainian commemorations of the 70th Anniversary of the Stalin inspired Artificial Ukrainian Famine of 1932-33, the 1st May 2003 is the beginning of an international protest campaign coordinated by organised Ukrainian communities around the world, under the aegis of the World Congress of Ukrainians, to have American journalist Walter Duranty's 1932 Pulitzer Prize posthumously revoked for the distortions, falshehoods and misrepresentations that were written by him about the 1932-1933 famine. He reported "there is no famine", New York Times, 31 March 1933. He claimed "any report of a famine is today an exaggeration or malignant propaganda", New York Times 24 August 1933. Then he admitted privately to William Strang (British Embassy, Moscow, 26 September 1933) that "it is quite possible that as many as ten million people may have died directly or indirectly from lack of food in the Soviet Union during the past year". At the time Malcolm Muggeridge worked in Ukraine as a journalist for the Manchester Guardian newspaper. His reports about the Great Famine of 1932-33 were both factual and accurate. He assessed Walter Duranty as "the greatest liar of any journalist I have ever met". If you feel that Duranty did not deserve to keep his 1932 Pulitzer Prize and you wish to add your voice to this protest campaign then PRESS HERE, complete the email form that appears and submit it online to the Pulitzer Prize Committee in New York. The campaign is being led by the Ukrainian Canadian Civil Liberties Association and is supported by the Association of Ukrainians in Great Britain, the Australian Federation of Ukrainian Organisations, the European Congress of Ukrainians, the Ukrainian American Justice Committee, the Ukrainian Canadian Congress and the Ukrainian Congress Committee of America. Canada is staring at a shortage of up to one million skilled workers within five years and Ottawa plans to work with provinces and territories to figure out how to attract replacements from abroad, Immigration Minister Denis Coderre said Saturday. Coderre said Canada needs to honour foreign credentials for professionals such as doctors, dentists and engineers so they are not forced to take menial jobs once they arrive here. "I have nothing against taxi drivers," Coderre told a meeting of the Canadian Bar Association. "I like them very much because probably every time I'm picking up a cab I have the greatest conversation. Why? Because they're foreign doctors and they're not recognized." Coderre said Ottawa may produce lists of countries that meet Canadian standards in various professions. "What we're looking for is a process," he said after his speech. Canada's immigration strategy also has to fan out from the three major centres of Toronto, Vancouver and Montreal in order to satisfy the skilled labour needs of less populated areas, Coderre stressed. He said 60 per cent of immigrants choose to settle in Toronto, followed by 15 per cent in Vancouver and 13 per cent in Montreal. That would leave 12 per cent of immigrants for the rest of Canada. "There is a situation where we will find two different Canadas," Coderre told the meeting, "the three major cities and the others." Coderre said this could be fixed by extending the temporary foreign worker program, with a promise of permanent resident status after three to five years, in exchange for a professional agreeing to settle in a smaller city. "You will work as a doctor in Flin Flon, or in Rimouski, and after three to five years the incentive is we will provide you as a permanent resident, that is the starting (point) of the process to become a Canadian citizen," Coderre told reporters. To implement these strategies, Coderre said he will hold a meeting with provincial and territorial officials in Ottawa this fall. He said the last time a similar meeting was held was 107 years ago, with the goal of populating western Canada by offering lots of land for $10 apiece. "It was a major reason why western Canada is what it is today, because of immigration strategy," Coderre said. "So we have to do the same thing." However, Coderre said the new immigration blitz will also have to be weighed against Canada's and North America's security concerns. "We have to find a balanced approach, with openness and vigilance, meaning we don't want to jeopardize the economy at the same time," he told reporters. He mentioned the possibility of using permanent resident identification cards and biometrics -- a system of fingerprint and iris recognition -- to increase security at entry points while allowing commerce to flow freely. Coderre said these security concerns would be discussed at the fall meeting. The Ukrainian Easter eggs have very little in common with the pastel-colored hard-boiled eggs that decorate homes on this holiday weekend. There are no chicken transfers, nor funny little bunny ears stuck to their 'heads'; there are no crayon lines and no names on these eggs..
Pysanka, the Ukrainian verb for 'to write', is the ancient art of the decorated egg. The tradition, which dates back to before the time of Abraham, is based on pagan beliefs where the egg is a symbol of birth - it is the origin of life. It is the power of the egg to create a new life that made it so mysterious to pagan believers, who thus incorporated it into their various rituals. Symbols expressing their beliefs about life and death were used to decorate the eggs. With the advent of Christianity to Ukraine, the egg became an important part of the Easter ritual associated with the new religion and many legends handed down throughout the ages relates the story of the origin of Easter eggs. One such legend was that when Christ was dying on the cross, blood flowing from his many wounds fell on the ground. Wherever a drop fell, a red Easter egg was created. Christ's mother, Mary, was standing beneath his cross praying and crying. Those red Easter eggs on which her tear would land, in turn, became elaborately decorated Easter eggs. Mary gathered all the eggs into a kerchief and went to Pontius Pilate to ask for permission to bury her son. On her way there, she gave an Easter egg to each child she met, along with the admonition to live in peace. Arriving at the palace of Pilate, Mary fainted and the Easter eggs from her kerchief rolled all over the world. From that day on, people everywhere decorate eggs at Easter time and give them to each other as an expression of love and peace. Thus in Ukrainian folklore, a pagan ritual was incorporated into Christianity. Ukrainian Easter egg painting begins with a raw white chicken egg, clean and dry. Divide the egg geometrically into quarters then sections, very lightly using a pencil. Then sketch a pattern on the egg. Using a tool called a kistky, begin applying wax to the parts of the pattern that will remain white. The traditional kistky is a small 5-inch dowel with an eraser-sized metal funnel attached. A very small shaving of beeswax is put into the cup and held near a candle flame. As the wax in the funnel melts through the fine tip, the design can be filled in. After the wax is applied to all the white sections of the pattern, the egg is dipped into a special dye. The colors are very deep, even the yellows and pinks. The wax on the egg keeps the dye from covering that part of the design. "First decide the colors you want, and use common sense, putting the lighter first," Preston explained. "You also have to think about what color you'll get by mixing the dyes each time." There has to be plenty of time for drying between each layer. "I usually work on many eggs at a time so while one is drying I can be working on another. Obviously the longer it stays in the dye, the darker it gets. The more intricate designs have to be dipped more times, with wax drawing done between dyes. Now comes the really fun part. The egg is held near the side of the flame, not over the flame, because carbon will collect on the shell and darken the design. When the wax looks wet (only a few seconds), wipe the wax off with a clean white cloth. Continue this process until all the wax is removed. «There's more than one smoldering volcano on the globe. Here's the atlas of evil and discord, along with some unlikely spots that could pose problems in the future». Belarus and Ukraine are «unstable states bordering new NATO members could threaten the region». (www.forbes.com/forbes/2003/0317/050.html) by Emily Lambert and Chana R. Schoenberger (left on picture), senior editor Bruce Upbin (right on picture). Forbes Magazine really laid an egg with this article, which ranks right up there with the worst and most inaccurate articles they have ever published. In the first place, there is no way Ukraine should have been associated with Belarus in the context of this article. Second, there is no way Ukraine should be listed in an "atlas of evil and discord" and as the first place where another Iraq could develop. Experts on Ukraine who have seen this item in Forbes wonder at how those two writers came up with such totally inaccurate information. People are encouraged to write to Forbes Magazine (letters@forbes.net) and point out the glaring inaccuracies in the article and urge them to publish accurate articles in the future. Vitali Klitschko was in the perfect position on Sunday morning. He's the number one contender for Lennox Lewis' WBC and Roy Jones' WBA Heavyweight titles. Vitali has made it clear though, he has his sights set on a battle with Lewis. So is Lewis vs. Klitschko coming soon? Not so fast. After Jones beat Ruiz for the WBA title on Saturday night in Las Vegas, a whole lot of backroom scheming has taken place. Fairness and decency have apparently been thrown out the window. First, a Lewis lawyer - perhaps acting as a paid mercenary to get rid of Klitschko - said to the media that Klitschko first had to fight a WBC title eliminator against Evander Holyfield in order to challenge Lewis. Wait a minute. I always thought being number one contender meant you were automatically deserved a title opportunity. No? Klitschko's promoter Peter Kohl then called Lewis' lawyer, in effect, a liar. Kohl said he had a contract with Lewis for a fight on either April 12 or April 19 in the U.S. Kohl said the WBC confirmed this in writing that Vitali was Lewis' "official challenger"...whatever that means. Next, suddenly, on Monday it got worse for Vitali Klitschko. We got news that the WBC was now ordering top-rated Vitali to fight an elimination bout against its next-highest rated boxer, in this case, the King-promoted Evander Holyfield. It seemed the WBC - along with it's co-conspirators - was screwing Vitali out of a title fight. Vitali Klitschko, heavyweight 1-ranked contender, claims in the lawsuit that Lewis has to fight him by June 8 if the World Boxing Council rules for mandatory title defences are followed. Under WBC rules, champions must defend against the top-ranked or most worthy opponent at least once a year. Lewis had been negotiating a fight with Klitschko, but dropped plans for the bout last month and announced that he would likely fight a rematch against Mike Tyson in June instead. But the Lewis-Tyson fight is dependent on how Tyson looks after knocking out Clifford Etienne on Feb. 23. Tyson was complaining the fight was too short and he was not ready to fight Lewis as both Lewis and Tyson's promoters wanted him to do on June 21. 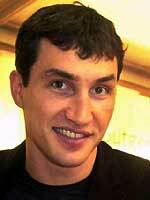 Vitali Klitschko is the brother of Wladimir Klitschko, who holds the fringe WBO version of the heavyweight title. 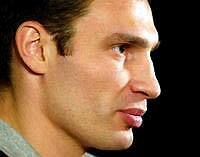 Wladimir Klitschko will fight Corrie Sanders on March 8 in Germany. The brothers are from the Ukraine. Both have doctorates in sports science from the University of Kiev - the Ukrainian capital. They live now in Germany, where they are very popular. Both smart, friendly and talkative, they make frequent appearances on television and Vitali is now often referred to as Doctor Faust after the character created by Johann Wolfgang von Goethe - a particularly fitting nickname since Vitali holds a university degree and Faust means fist in German. DISCLAIMER : This website does not represent implicitly or explicitly the official or unofficial position of Association «Zustrich». It is not responsible for any content, off this site, to which it links. Any suggestions, propositions, materials send to webmaster : andriy_ca@yahoo.com.